soil is chiefly clay; subsoil, clay. In the Doomsday Book, 1086, the name is given as Aissa. 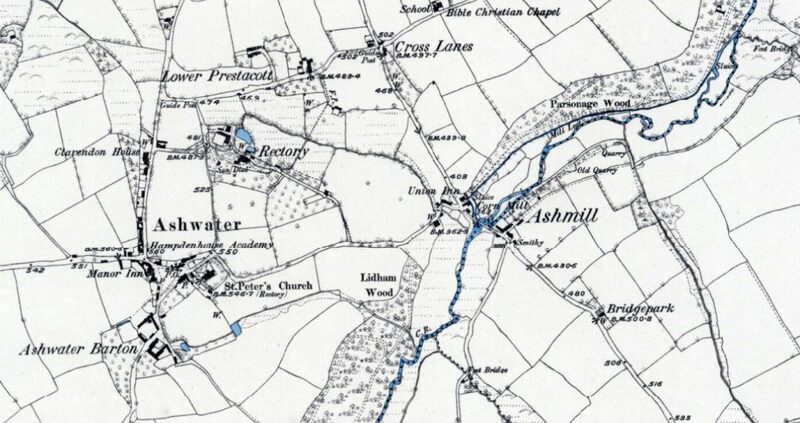 In 1270 it was Esse Water and by 1281 had become Assewalteri. The two Manors of Aissa and Hindefort became Ashwater Barton and Henford Barton. 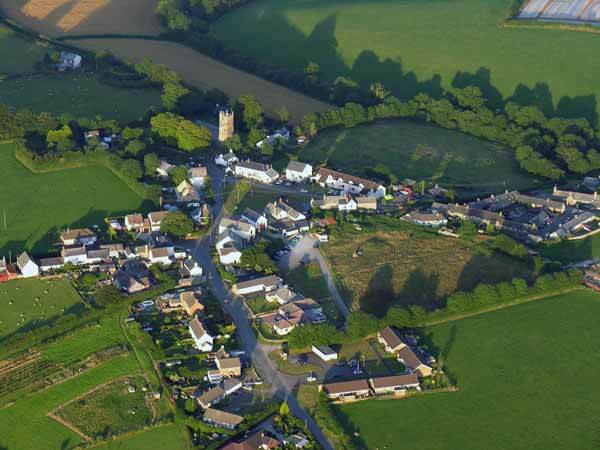 As well as the village itself, the parish includes several hamlets, such as Henford, Quoditch and part of Ashmill, which lies directly on the boundary between Ashwater and Broadwoodwidger parishes. 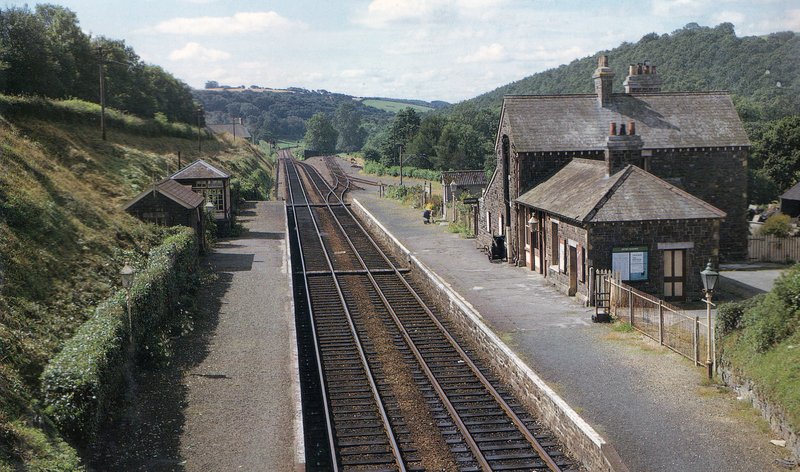 It is close by the Cornish border, and is about 10 miles north of Launceston. Fairs for cattle were held here on the first Tuesday in May, and the first Monday after the 1st of August. At the feet of the figures is a mutilated carving of the Holy Trinity of the same design as that at Plympton St. Mary. In the east window of the aisle are coloured shields, the left hand has the arms of the Carew family impaling the arms of Carminow; Sir Thomas Carew and his wife Joan who was a Carminow. The right hand shield has on one side the arms of the Courtenay family quartered with the De Redvers arms, the other side is blank, but probably has Carminow arms impaled and the shield would represent Sir Hugh Courtenay and his wife Margaret Carminow. 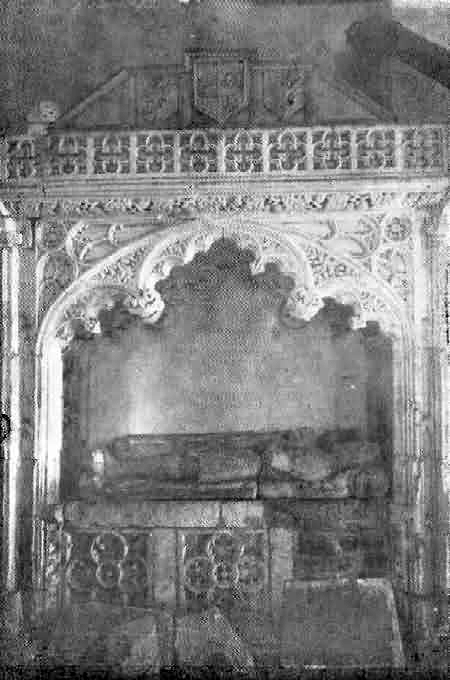 Above the shields is the letter “M”, this may be the monogram of Sir H. Malenory, but I think it more likely that this end of the aisle was used as a Lady Chapel and that it is the monogram of the Blessed Virgin. Some old stones near the monument were found during a restoration of the church, built in one of the walls, they evidently formed part of a Norman doorway, probably the south (the north is Norman), and old portions of the original building. On the south wall is a large representation in plaster of the Royal arms dated “C. R. 1638“. 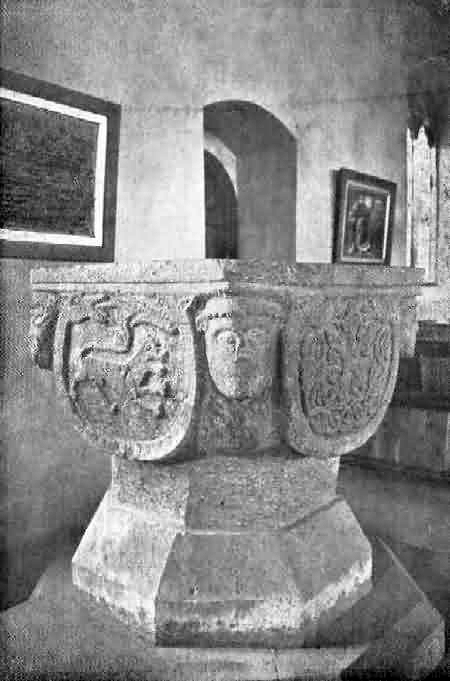 There is a fine Norman font with faces or masks at the corners, it is constructed of some stone with the appearance of granite, but is certainly not of that material, it may be a stone of volcanic origin found in Cornwall. The font and north doorway are the only remains of Norman work in the church. The church was struck by lightning in 1699, the present pinnacles were erected at that restoration. There is a modern rood beam with cross, and there are some very good modern bench-ends. Between 1864 and 1897 a great deal of ‘restorative’ work was throughout the church and at that time the bells were rehung. The tower was the venue for a bell-ringing competition for King George III’s jubilee in 1809. Ashwater’s bells rang for Waterloo; local men watched from the tower for enemy bombers in World War II; the bells rang Victory 3 peals at War’s end and again to mark the Millennium. The bells and the tower feature in a song that dates from the time of George III’s Golden Jubilee in 1809. 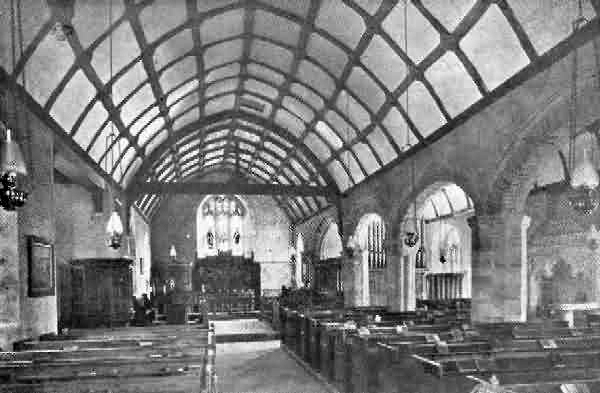 As has been previously stated, the church was restored in 1876 at a cost of 1,200; in 1889 it was further restored, when the chancel was rebuilt, new-roofed with oak and re-floored and carved oak choir stalls and other fittings erected : a fine carved oak pulpit, carried out by John Northcott. The register dates from the year 1558, and records the baptism here of the father of General Monk, afterwards Duke of Albemarle. 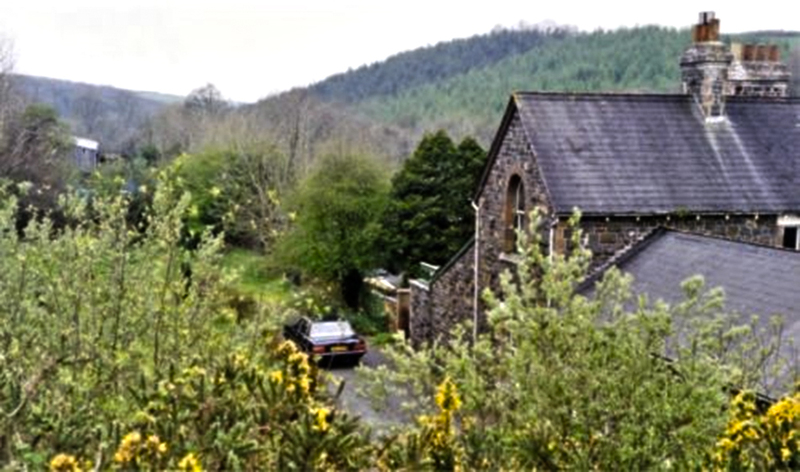 The Bible Christian Chapel was built in 1865 just outside the village, on land provided by a local farmer. The interior of the Chapel was renovated in 1997 but original features, such as the pews with doors, were retained. 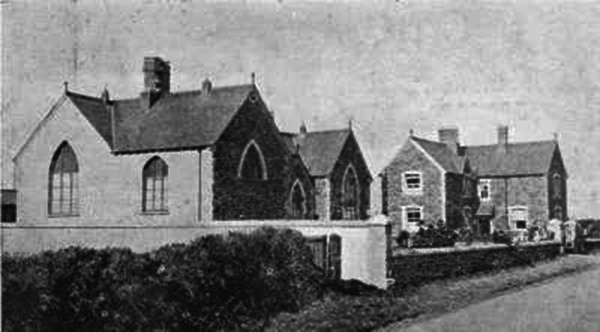 Until the Deed of Union in 1932 there were several branches of the Methodist Church. The Chapel is now closed. 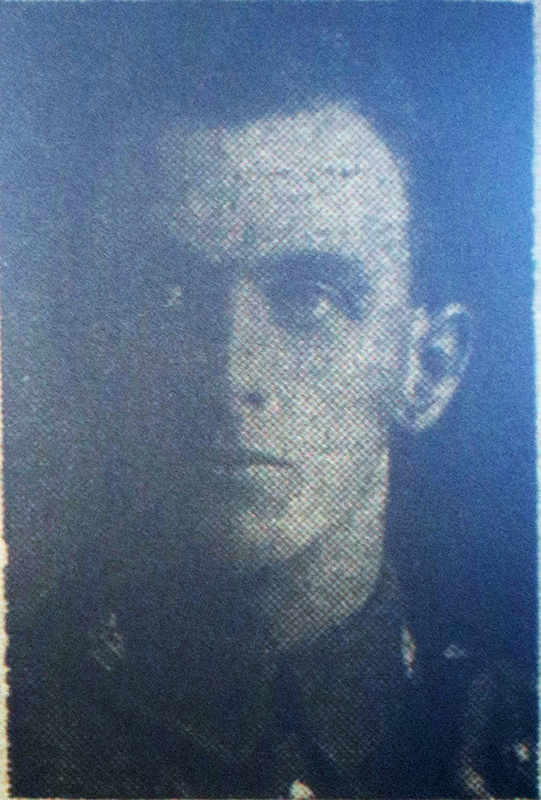 2nd Lieutenant Fred Burnett awarded the M.C. in November 1917. Samuel was born in 1891 at Clawton to William and Jane Boundy. He enlisted with the Duke of Cornwall’s Light Infantry (Regimental No. 24140) as a Lance Corporal serving with the 10th Battalion. He was killed during the First Battle Of Bapaume (part of the Battle of the Somme) on March 25th, 1918 aged 27. His body was never identified but he is commemorated on the Arras Memorial, Pas de Calais, France, Bay 6. He is also commemorated on the Ashwater War Memorial. Leonard was born in 1894 to Thomas and Emma Bray at Landue Mill, Lezant. His Father was a Agricultural Worker. By 1911 Thomas had passed away and the family had moved to Tredown Cottages, Lezant with Leonard working as a Farm Labourer. 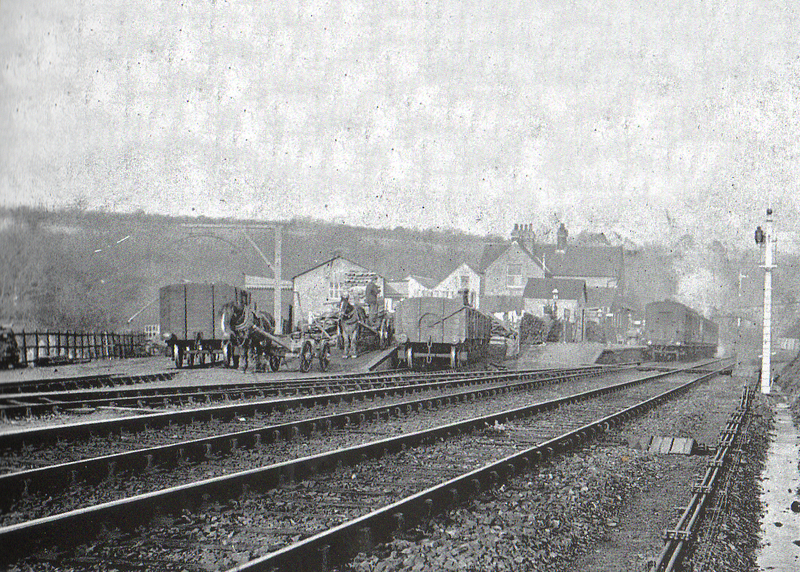 He enlisted at Holsworthy with the Royal North Devon Hussars Yeomanry as a Private (Regimental No. 930) with the 1/1st although. 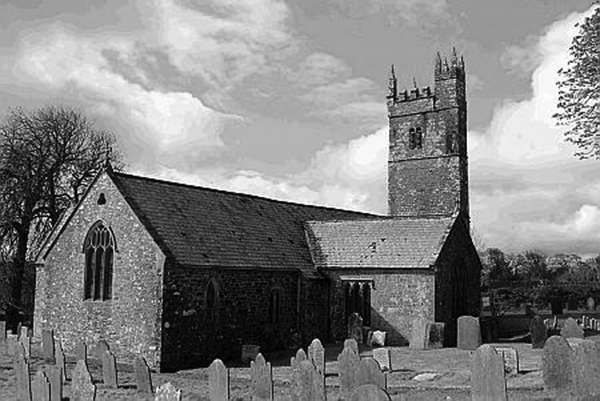 At the time he was residing at Beaworthy, Devon. The 1/1st were with the 2nd South Western Mounted Brigade, who in September 1915 left Colchester for Liverpool. On September 24th it boarded ‘RMS Olympic’ and sailed the next day. It arrived at Mudros on October 1st and then on to Suvla Bay. The regiment landed in Gallipoli on October 9th and was attached to the 11th (Northern) Division (digging trenches). In November it was in the firing line, attached to the 2nd Mounted Division and 53rd (Welsh) Infantry Division. It was during this November fighting that Leonard was killed in action on November 29th, 1915 aged 22. He was interred in the Green Hill Cemetery, Turkey. Plot I. Row A. Grave 19. He is commemorated on the Ashwater and Lezant War Memorials. 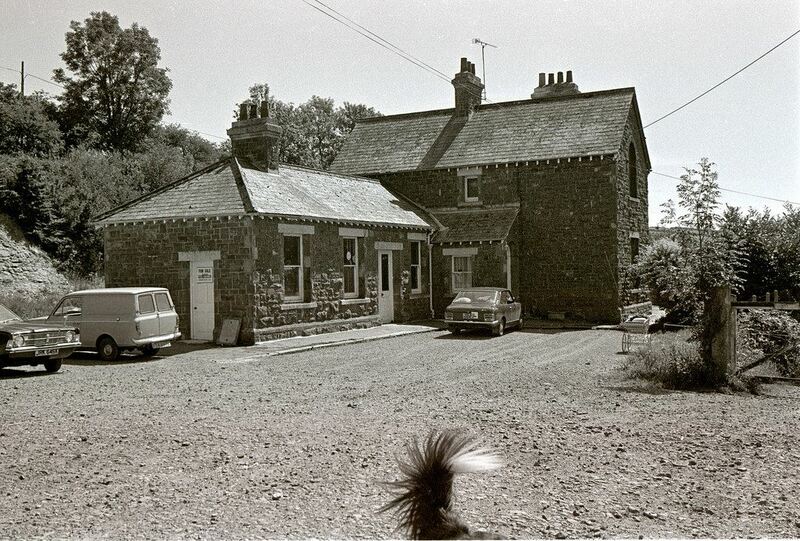 At the time of his death, his Brother, Frederick Bray, was living at Barton Cottages, Dunterton, Tavistock. With such heavy losses in his company, it was no surprise to learn that Frank soon rose to the rank of Lance Corporal and was whilst serving with the ‘C’ Company of the 2nd Battalion when he was killed in action during an attack on the German trenches on the Fromelles-Sailly Road on December 18th, 1914. His body was never identified but his name is commemorated on the Ploegsteert Memorial, Panel 1 and on the Broadwoodwidger Church Roll of Honour. On Friday Dec 18th I was ordered by Captain PAYNTER to lead an attack on the German trenches with 2 Coys of the 2nd Bn Scots Guards. The RIGHT of the attack to rest on the FROMELLES – SAILLY Road, the LEFT of our line approximately 400 yards E of this point where the border Regt joined our lines in No 2 subsection. This Regt was to carry on from this point. I was ordered to meet Captain ASKEW and arrange details with him at 3:45pm. The attack was timed for 6pm. It was arranged that at 6pm the men should be posted over the parapet and to crawl out under the wire fence and lie down. When this was done I was to blow my whistle and the line was then to move forward together and walk as far as they could until the Germans opened fire and then rush the front line trenches. Having reached the trench I was to try and hold it, if occupied, and if unoccupied to push on to the second line. The men carried spades and sandbags. F Coy Captain Sir F FITZWYGRAM, LF Captain H TAYLOR. At about three minutes to 6pm the men were hoisted over the parapet and lay down. I blew my whistle as loud as I could but, owing to the noise of our gun fire, it appears that it was not generally heard. F coy being on the RIGHT and LF on the LEFT we began to move forward. After advancing about 60 yards I could see that in several places the line was not being maintained; some men moving forward faster than others. I could see this by the flash from the guns. I collected the men nearest to me and I found myself practically on the parapet before the Germans opened fire. There was no wire entanglement at this point. We bayoneted and killed all the Germans we could see in the trench and then jumped down into it. There was a certain amount of shouting and confusion. I could not see far to my RIGHT or LEFT or tell what was happening on either flank. The position of the trench in which I found myself was not traversed for a distance of at least 25 yards. I ordered the men to make firing positions in the rear face of the trench. This was not easily done owing to the depth of the trench. I also told off some men to watch the flanks and, if the enemy appeared, to make traverses. I remained in the trench some time, about one hour, and then thought I had better try and see what had happened at other places in the line. I got out of the trench, which I left in charge of Lieut SAUMAREZ, and told him to hang on. I found it impossible to get any information but could see a good many dead bodies lying close to the German parapet. I decided to come back to report to Captain PAYNTER and explain what the situation was and suggest that, if the trench was to be held, reinforcements would have to be sent up. This he reported to the Brigadier as it then became apparent that the attack of the border Regt had failed and also that 2 Coys RIGHT had only succeeded in getting into the trench in a few places he was ordered not to send forward the remaining two Coys which were in reserve. I was then ordered to organise a digging party to sap to the German trench. This was attempted but, owing to a continuous German fire, it soon became clear that the distance, 180 yards, was too much. About 3am Lieut WARNER and a party of 10 men were led forward by Corporal JONES to the section of the German trench which was still in tact. He reached it alright and found Lieut SAUMAREZ wounded [in the hand and that a stretcher was sent out and, with great difficulty, Lieut SAUMAREZ was removed]. Lieut WARNER was ordered to withdraw. Just before dawn he accomplished this without loss. Shortly after the attack was launched Lieut OTTLEY and a party from G Coy were sent up to reinforce Lieut HANBURY TRACY. While at the head of his men he was mortally wounded before reaching the German trench and the rest of the party don’t appear to have been able to reach the trench. Corporal MITCHELL, with great courage, brought back Lieut OTTLEY (Lieut OTTLEY was awarded a DSO). Captain LODER was the only officer who returned unwounded. Pte CLARKSON has an Iron Cross which he found on a dead German officer. It’s only anecdotal but in a BBC programme on the Christmas Truce it said that there was a mass burial on that day. This would suggest (no more than that) that those burials were of men, including Frank from that same raid. 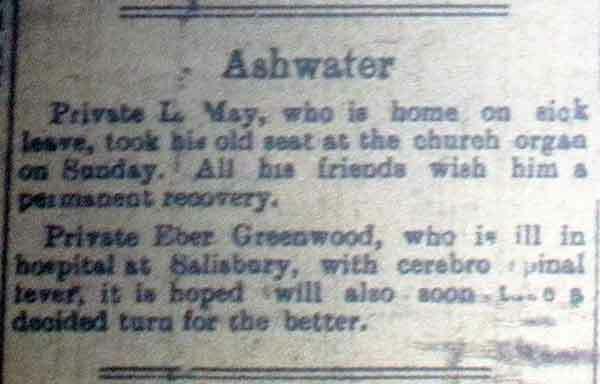 Cyril was in 1895 in Ashwater to Eber and Fanny Dockett. He enlisted in 1915 with the 2nd/15th County of London Battalion (the Civil Service Battalion, The Prince of Wales’ Own Civil Service Rifles ) (Regimental No. 532278) as a Private. The 2/15th become part of the 60th (London) Division, and finally went to France in 1916, serving at Vimy before moving to Salonika in the winter of 1916. In 1917 it moved to Palestine, and took part in the fighting for Gaza and Jerusalem. Cyril died of his wounds sustained during the Capture of Jericho on February 21st, 1918 aged 23. He was interred in the Jerusalem War Cemetery, Israel, S 66. He is also commemorated on the Ashwater War Memorial. At the time of his death, Cyril was recorded as living in Thornton Heath. The Capture of Jericho occurred between February 19th and 21st,1918 to the east of Jerusalem beginning the Occupation of the Jordan Valley during the Sinai and Palestine Campaign of the First World War. Fighting took place in an area bordered by the Bethlehem–Nablus road in the west, the Jordan River in the east, and north of a line from Jerusalem to the Dead Sea. Here a British Empire force attacked Ottoman positions, forcing them back to Jericho and eventually across the Jordan River. 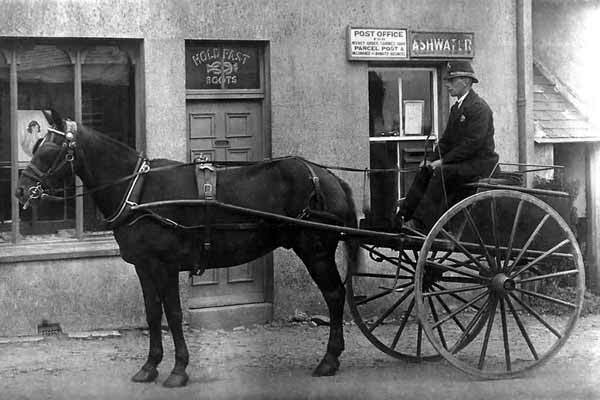 William was born in 1888 in Holsworthy to Samuel and Elizabeth Gliddon. He enlisted as a Private in 1914 with the 2nd/5th Battalion of the Royal Warwickshire Regiment (Regimental No. 203239). Serving as part of the 182nd Brigade of the 61st Division his Battalion were fighting in the Battle of Cambrai when William was killed in action on December 3rd, 1917 aged 29. His body was never identified but his name is commemorated on the Cambrai Memorial, Panel 3. He is also commemorated on the Ashwater War Memorial. William was born in 1882 in Clawton to Richard and Elizabeth Ham. He enlisted with the 1st/ 5th Battalion of the Duke of Cornwall’s Light Infantry (Regimental No. 240562) as a Private. He was killed in action during the Operations on the Ancre on February 8th, 1917 aged 35. His body was never identified but he is commemorated on the Thiepval Memorial, Pier and Face 6 B. He is also commemorated on the Ashwater War Memorial. John was born in 1898 at East Statfold, Ashwater to John and Mary Jordan. He enlisted with the Infantry Battalion of the Machine Gun Regiment (Regimental No. 148549) serving as a Private with 150th Company. He was killed in action on May 5th, 1917 during the Second Battle of Arras, aged 19. His body was never identified but he is commemorated on the Arras Memorial, Pas de Calais, France, Bay 10. He is also commemorated on the Ashwater War Memorial. William was born in 1898 at Milton Damerell to Barney and Bessie Moore of Quoditch, Ashwater. He enlisted with the 115th Battery, the 25th Brigade, the Royal Field Artillery as a Private (Regimental No. 216141). He was killed in action on December 5th, 1917, aged 20. The 25th Brigade was originally formed with 113th, 114th and 115th Batteries, and attached to 1st Infantry Division. He is commemorated on the Ashwater War Memorial. 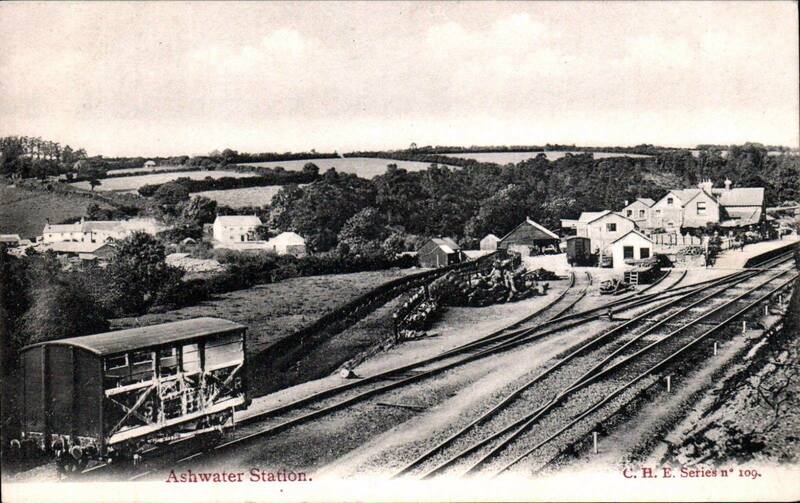 Albert was born in 1892 in Holsworthy to Richard and Betsy Perkin. He enlisted with the 1st/4th Battalion of the the Oxford and Bucks Light Infantry as a Private (Regimental No. 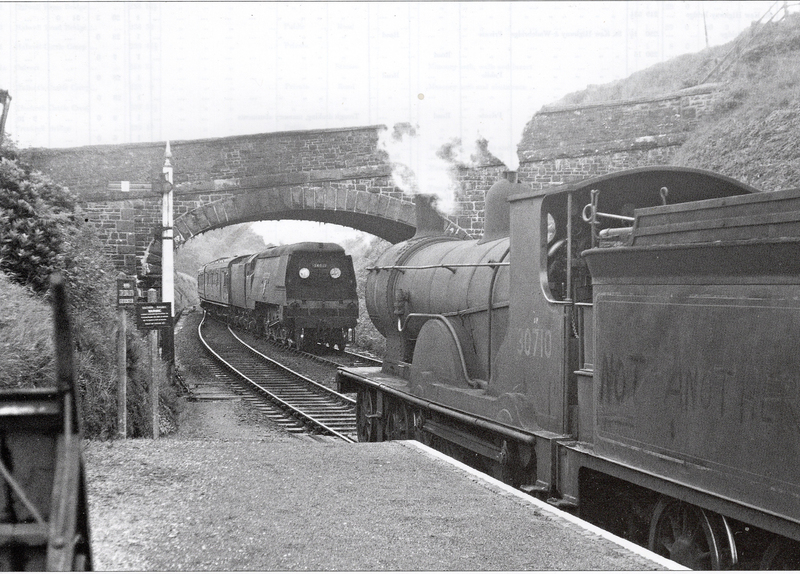 6107). He was killed when a shell burst in his trench North of Ovillers on August 25th, 1916 aged 24. He was interred in the Pozieres British Cemetery, Ovillers-La Boisselle, Somme, France, Plot 4, Row H, Grave 6. His Body was exhumed from Map Ref:- 57d X.2. on 12/05/1919 (original Grave marked with Battalion Cross) , then reburied at his current resting place. He is also commemorated on the Ashwater War Memorial. On his record it was stated that he was the husband of Plena G. Westlake (formerly Perkin), of Highway, Jacobstow, St. Gennys but at the time of his death the couple were living in Ashwater. Some hostile shelling. Otherwise very quiet throughout the day. B Coy relieved D on left. D moving into Reserve, and A moving up into Support 1/5 th GLOSTERS relieved 1 st BUCKS on our left. Orders received that consolidation only required, so no further attack made on point 79. Hostile artillery very active on our right front Coy, doing much damage to trenches around 48. Patrols during the night got well up to trench 79-91 and reported enemy digging energetically, and apparently the garrison of the trench in many cases, not in the actual trench, but in shell holes just behind. 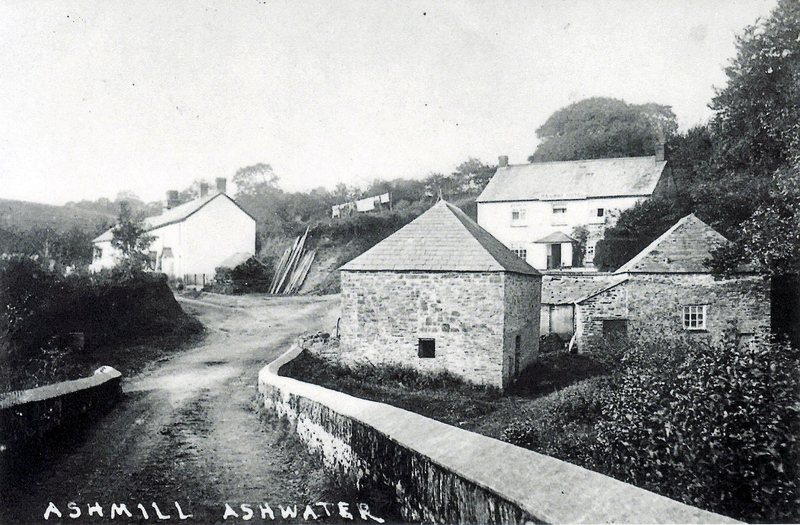 Samuel was born in 1886 at Ashwater to Arthur and Mary Petherick. He enlisted in 1914 with the 1st/4th Battalion of the Devonshire Regiment eventually rising in the ranks to Sergeant (Regimental No.203658). He died on January 24th, 1919 aged 33. He was interred in the Kantara War Memorial Cemetery, Egypt, E. 319. He is also commemorated on the Ashwater War Memorial. Charles was born in 1893 at Broadwoodwidger to William and Millicent Stephens. He enlisted with the Royal North Devon Hussars (Regimental No. 931) serving with the 1st/1st as a Private. He died of dysentery on October 21st, 1915 aged 22. He was interred in the Alexandria (Chatby) Military and War Cemetery, Egypt, F. 5. He is also commemorated on the Ashwater War Memorial. 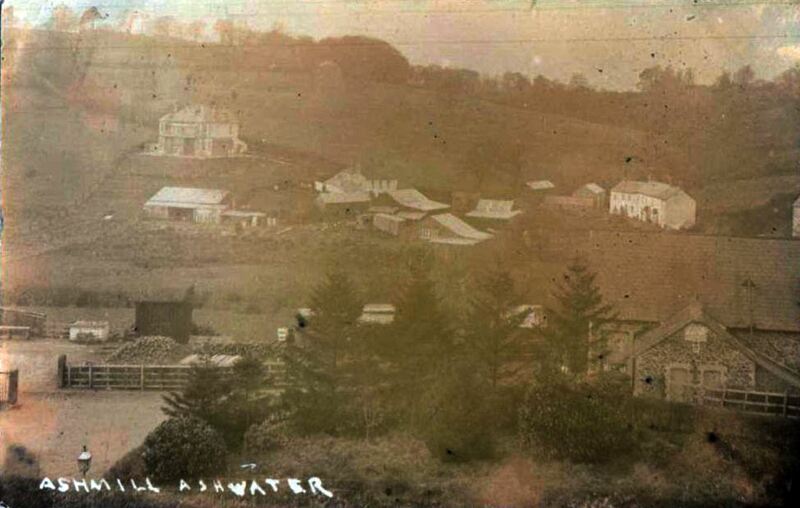 On his death his mother was living at Whiddon, Ashwater. 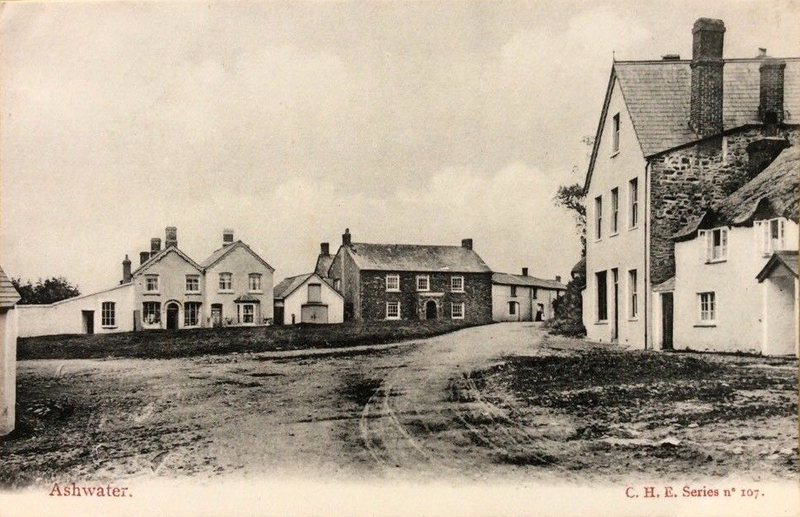 William was born 19th July 1895 at Davidstow to John Henry and Mary Tubb. William enlisted in the Devonshire Regiment as a Private (Regimental No. 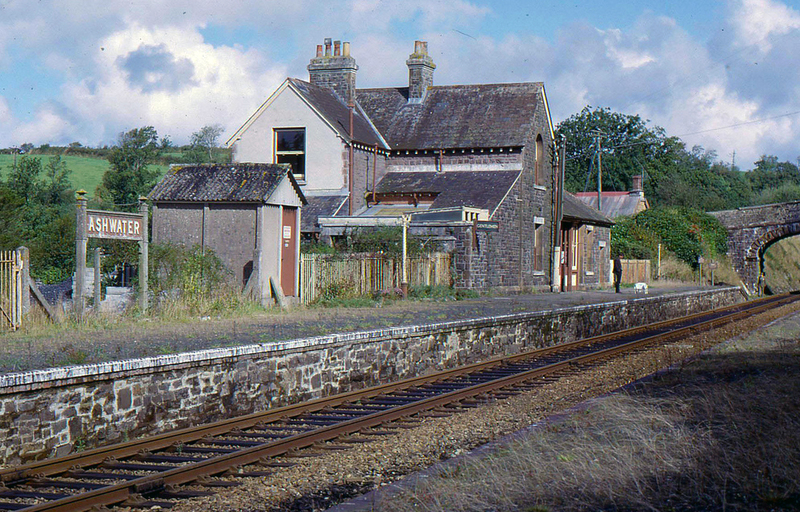 5036). He served with the 1st/6th Battalion. He was killed in action on March 8th, 1916 aged 20. His body was never identified but he is commemorated on the Basra Memorial, Iraq, Panel 11. He is also commemorated on the Ashwater War Memorial. At the time of his death his parents were living at No. 4, Bridge Park, Ashwater. At the end of 1915 the 1/6th were sent to Mesopotamia and they arrived at Basra on January 3rd 1916. Marching 300 miles up country through swamps, marshes and deserts, they suffered sickness and attacks from local Arabs before reaching Orah. From here, in early March, they launched an attempt to relieve the besieged garrison at Kut el Amara. Tantalisingly, they were within sight of Kut when a bungled artillery bombardment warned the Turks of their advance and heavy shell and machine gun fire forced them to retreat. The 1/6th lost 201 casualties including William and were congratulated on their bravery. Bert was born in September 1920 in St. Germans to Edwin and Ethel Bazley. He enlisted with the Royal Navy (Service No. D/JX 135256) as a Telegraphist serving aboard HM Submarine Seahorse. At the onset of World War II, Seahorse was a member of the 2nd Submarine Flotilla. From August 23rd–26th, 1939, the 2nd Submarine Flotilla transferred to its war base, Dundee and Blyth. On December 26th,1939 she sailed from Blyth for patrol off the east coast of Denmark. Four days later she shifted position to the entrance of the Elbe. She did not return on her due date of 9 January 9th, 1940. It was first thought that she had been mined but German records, examined after the war, suggest she was the victim of the German First Minesweeper Flotilla which reported a sustained depth charge attack on an unidentified submarine on 7 January 7th, 1940. It is however also possible that she was rammed and sunk by the German Sperrbrecher IV/Oakland south east of Helgoland on December 29th, 1939 Bert is officially listed as being killed on January 12th, 1940 aged 25. His body was never recovered but he is commemorated on the Plymouth Naval Memorial, Panel 39, Column 3, as well as on the Ashwater War Memorial. At the time of his death his parents were living in Ashwater. 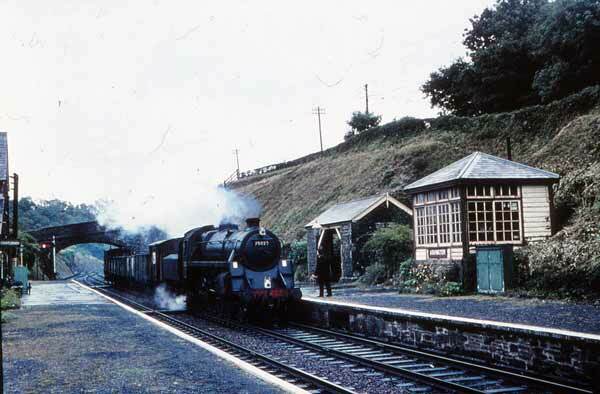 Vernon was born in the Newton Abbot area in the September Quarter of 1920 to George and Mary Burnett. He enlisted with the RAF VR, 612 Squadron (Service No. 1311994) as a Sergeant. He was reported as being killed when his plane failed to return to base after a mission on August 4th, 1943 aged 22. His body was never recovered but he is commemorated on the Runnymeade Memorial, Surrey, Panel 144, as well as on the Ashwater War Memorial. Towards the end of 1942 the 612 Squadron began to convert to the Leigh Light Wellington, and operations off the Norwegian coast began, but in February the Wellingtons were removed and given to Nos.172 and 179 Squadrons instead. No.612 finally converted at Davidstow Moor in April-May 1943.The last Whitley operation was flown in June. For the rest of 1943 and the early months of 1944 the squadron focused on night sorties over the Bay of Biscay, hoping to attack German U-boats as they were crossing the bay. Vernon’s flight took off at 23:15 with Wellington XiV MP654/J but returned to base with engine trouble and landing at 00:48 on August 4th. Took off with a new aircraft (Wellington XIV HF128/P) at 01:48 and but then failed to return. Crew missing in action: Sergeant Vernon Francis Burnett (RAF VR, 1311994), Warrant Officer John William Jones (RAF VR, 1154432), Flight Sergeant Jack William Low (RAF VR, 1335464), Sergeant Eric Middleton (RAF VR, 1312412), Flight Sergeant William Henry Smitham (RAF VR, 1108739), Sergeant Horace Wharton (RAF VR, 1073453). Percival was born in Ashwater in the March Quarter of 1920 to Daniel and Florence Lashbrook. 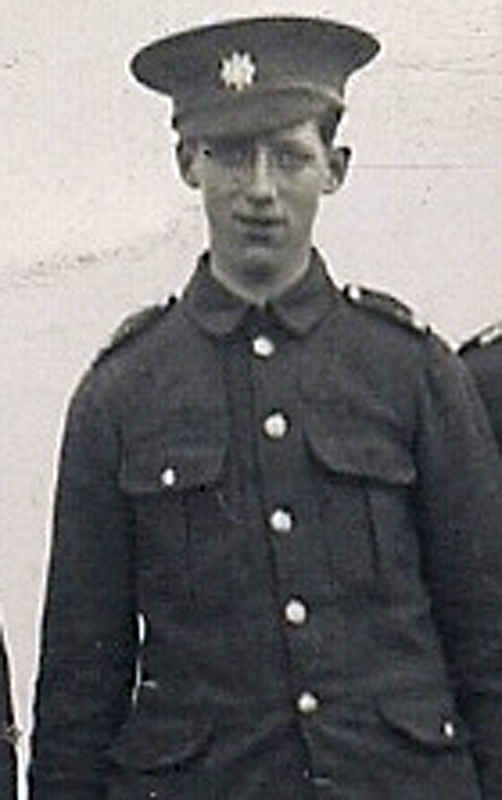 Percival enlisted as a Private with the 1st/6th Battalion of the Queen’s Regiment (the West Surrey) (Regimental No. 5621538) serving with the 131st Infantry Brigade, which was a part of the 44th (Home Counties) Infantry Division. The division was later sent to North Africa in mid-1942 to join the British Eighth Army and fought in the Battle of Alam el Halfa where Percival was killed in action on October 24th, 1942 aged 22. He was interred in the El Alamein War Cemetery, Plot 29, Row C, Grave 21. He is also commemorated on the Ashwater War Memorial. At the time of his death he is recorded as being the husband of Katie Lashbrook, of St. Just in Penwith, Cornwall. 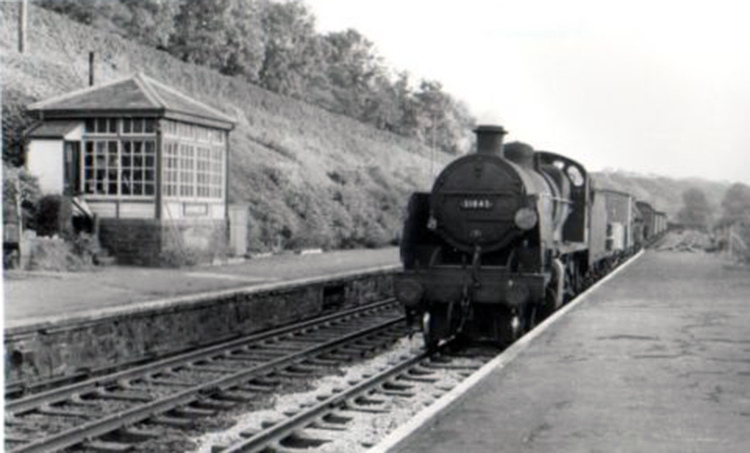 Derek was born in Ashwater in the June Quarter of 1923 to William and Mabel Stribley of Ashwater. He enlisted with the RAF VR, 77 Squadron (Service No. 1605487) as a Flight Sergeant. He was killed when his plane crashed at Tiestelsen on October 22nd, 1943 aged 20. He was interred in a collective grave at the Hanover War Cemetery, Niedersachsen, Germany, grave 11. F. 3-10. He is also commemorated on the Ashwater War Memorial. 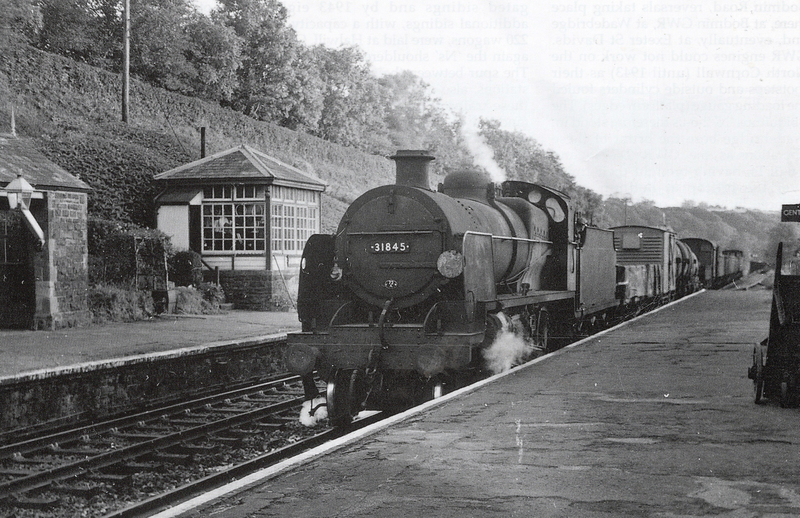 34066 Spitfire at Ashwater Station in September 1964. Post & M. 0. O., S. B. & Annuity & Insurance Office. 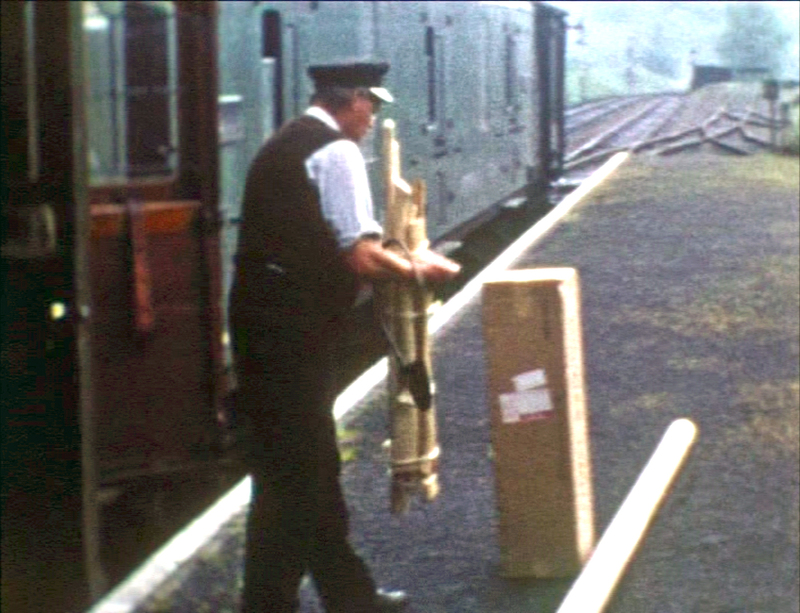 Richard Hocking Moon, sub-postmaster. Letters received from Seaworthy R.S.O. 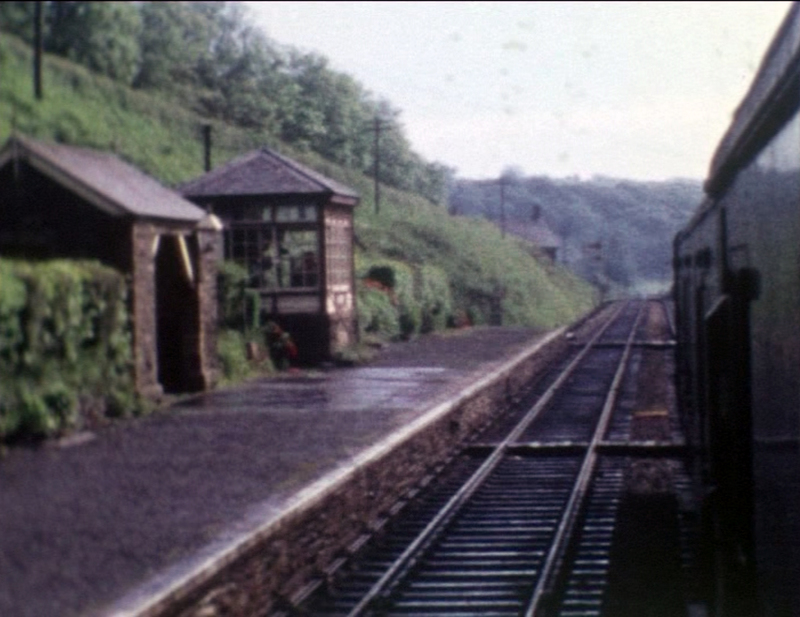 North Devon, at 8.30 a.m.; dispatched at 5.10 p.m. Postal orders are issued here, but not paid. The telegraph office is at the Railway station Wall Letter Box, Ashmill, cleared at A 4.45 p.m School Board of 5 members was formed May 1, Sydney Dockett, clerk to the board 1871; Board School (mixed) (formerly a chapel), it will hold no children; average attendance, 80; Charles Alfred Habley, master ; Miss Mary Bromell, sewing mistress Board School, Hunscott (mixed), for 50 children average attendance, 36; Miss A. Mitchell, mistress. 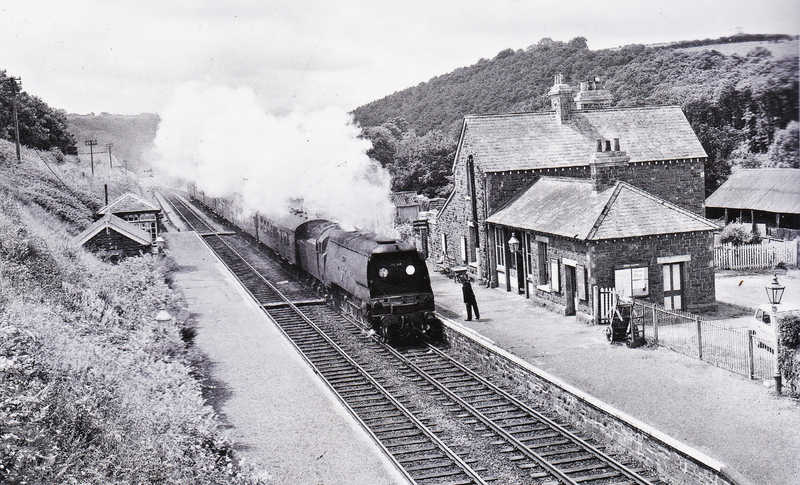 Railway Stations. 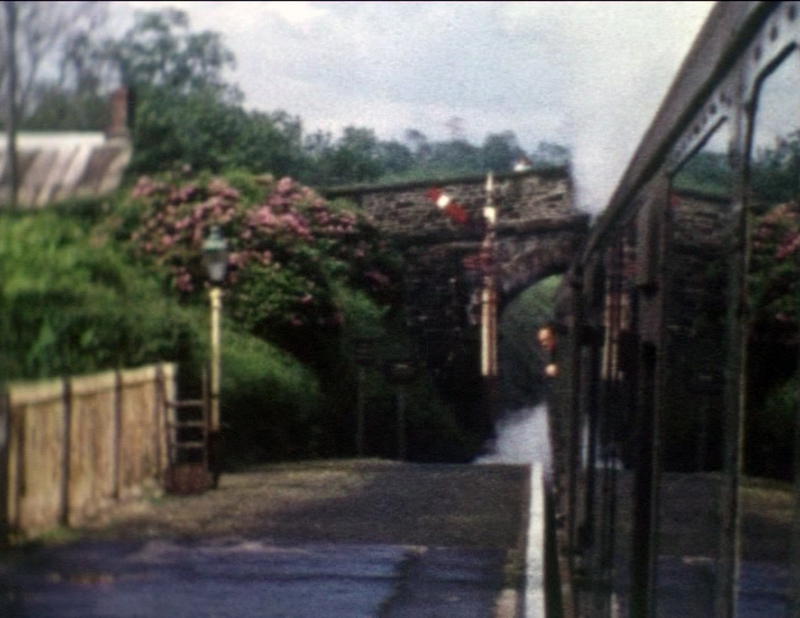 Ashwater, Edward Charles Liley, station master. 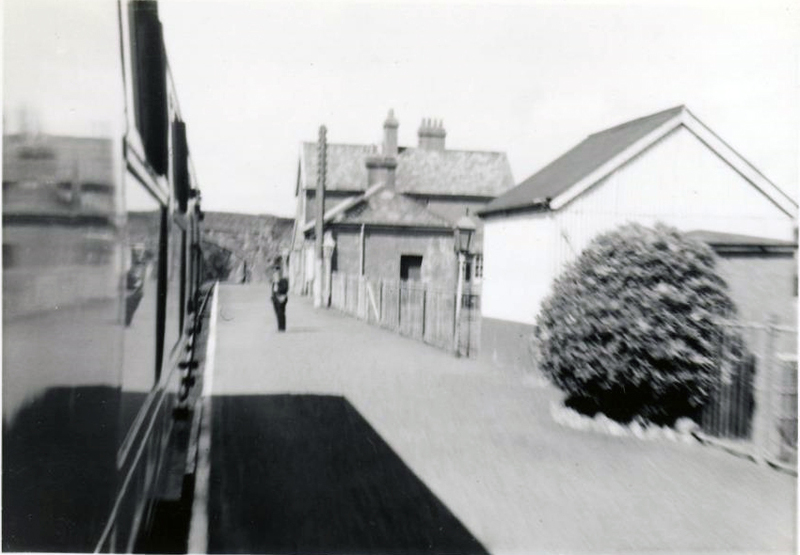 Dunsland Cross, William Pincombe, station master. Marked thus * receive letters thro’ Brandis Corner R.S.O. Marked thus **receive letters thro’ Tet-cott, Holsworthy. Marked thus *** received letters thro’ Clawton, Holsworthy. ** Clifton William, carpenter, Enford.